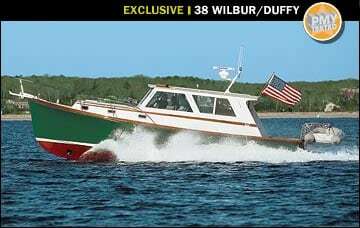 I’m told it was a picture-perfect, Indian summer morning in mid-November when Jerry and Diane Lynch launched their new 38 Wilbur/Duffy Lonrach—the perfect day for a boat whose namesake means “brilliant” in Gaelic, to ease her hunter-green hull into the crisp, Maine water for her maiden voyage to her homeport in Cape Cod, Massachusetts. Now a month later it’s a beautiful, mid-December, Cape Cod morning. Wilbur Yachts’ president John Kachmar, the Lynches, and yours truly are at East Marine, ready to take Lonrach for a wring-out. But today the mercury is registering a meager 16F, with winds out of the northeast at 15 mph. And as Lonrach’s being hauled the next day for winter stowage, there’s no delaying the test. So, first things first. I test the radar gun to make sure it will work from inside. It will (yeehaw! ), and no sooner than that, we’re pulling away from the dock. As luck would have it, the radar gun doesn’t register from inside, thanks to my meager 5’1” height, and so I must run the numbers from outside despite the arctic chill and a few numb fingers, it is still a brilliant day. Why? 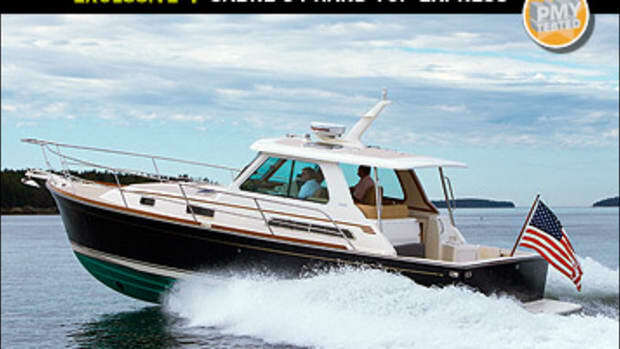 Well, quite simply, the 38 is a brilliant boat. 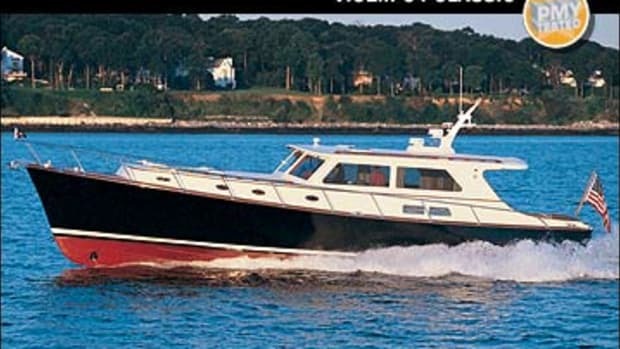 Lonrach boasts many unique interior features (she is, after all, fully custom) that make her both classic and modern and a perfect fit for this soon-to-be-retired cruising couple. 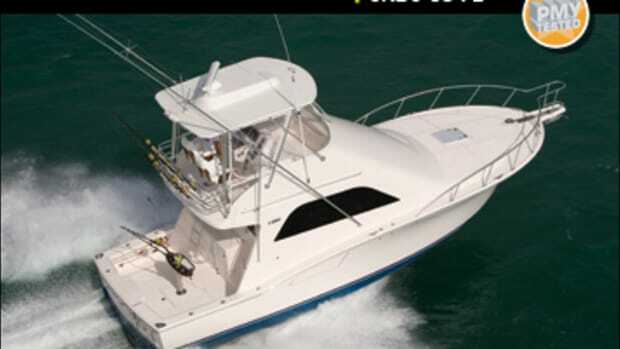 The Lynches wanted an enclosed pilothouse to facilitate their plan of extended cruising up and down the Eastern Seaboard. 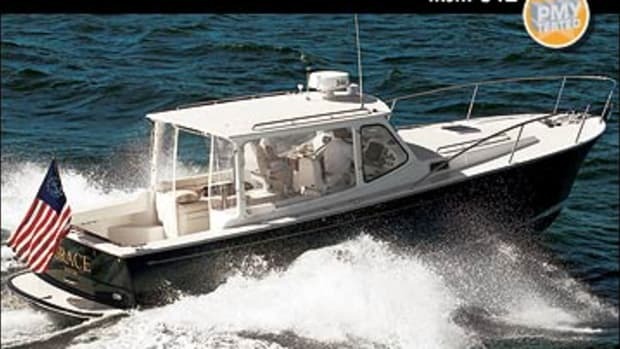 Since they didn’t use the flying-bridge helm on their previous 38 often (the boat also had a lower station) and figured they’d encounter low bridges along the way to Florida, the Lynches felt they’d be better off without it. So instead of sending the 38 into the yard for a refit, back to the drawing board they went. “We thought it was a brilliant idea to go into debt at our age and a brilliant idea to take on a project of this magnitude at our age,” Jerry, who is in his 70’s, tells me. And thus, $850,000 later (base price for the 38 Wilbur/Duffy is $500,250), Lonrach was born. 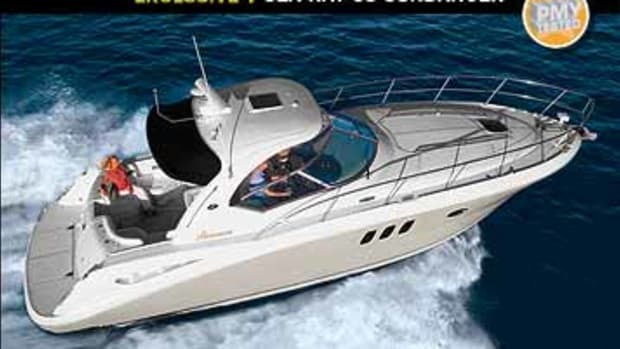 Four special engine mounts and a Soundown elastic coupling help to isolate engine vibration, and a Soundown axial exhaust system reduces exhaust noise. The package also includes what Soundown refers to as a “built-in-place insulation program.” In the case of Lonrach, that means using damped aluminum panels on the overhead and forward and aft bulkheads backed with quarter-inch-thick Tuff-Mass Barrier, which adds sound-blocking capabilities by building up mass. In addition, the cockpit sole is floated (spring-mounted) to decouple it from engine-generated vibration, and absorption materials are concealed in the panels in the ceiling to further reduce any ambient sound. The results are impressive: With the engine literally inches beneath my feet, the decibel meter registered a low 82 dB-A while running at WOT (65 is the level of normal conversation). The 38’s interior arrangement reflects Wilbur’s knack for delivering what Kachmar says is a Wilbur trademark: “a high-quality boat, without the glitz.” The first things I noticed upon stepping inside the saloon via the sliding door from the cockpit (the previous 38 had swing-out hinged doors) is the stunning woodwork and windows, 14 of them to be exact. The saloon is flooded with light, and teak abounds: in the overheads, under foot, in the handrails, on the back of the double-wide helm seat and port-side companion seat, in the china cabinet in the galley, and more. 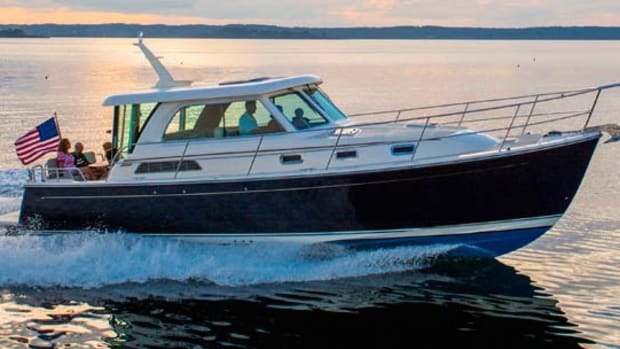 All this, plus custom upholstery on the settee to port—which converts to a double berth—and helm and passenger seats, creates an upscale yet understated Downeast look inside. Interestingly, although Lonrach measures nearly 40 feet overall, the Lynches opted for a single-stateroom, two-head arrangement. 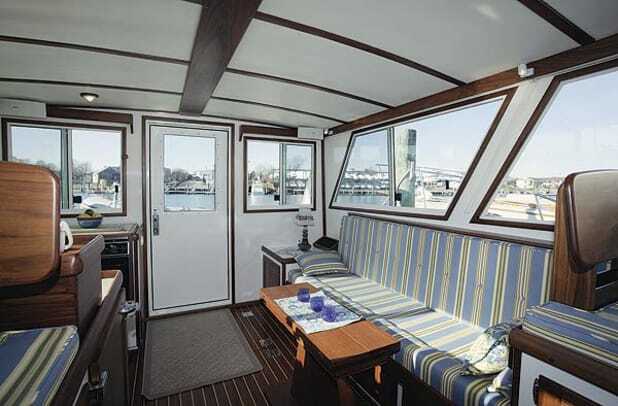 The forepeak master has headroom in excess of seven feet and built-in stowage practically everywhere: under the queen-size island berth that’s flanked with teak ceilings; in a six-drawer closet and hanging locker to port; and in another locker to starboard. 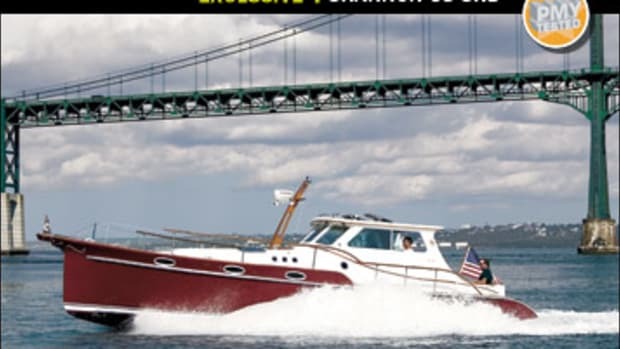 What’s really neat, though, are the two head compartments, aft of the master and accessible from a centerline companionway. Both have sinks, but the one to port also has a standup shower, and the one to starboard has an MSD, which Jerry and Diane like because they can both be getting ready at the same time. 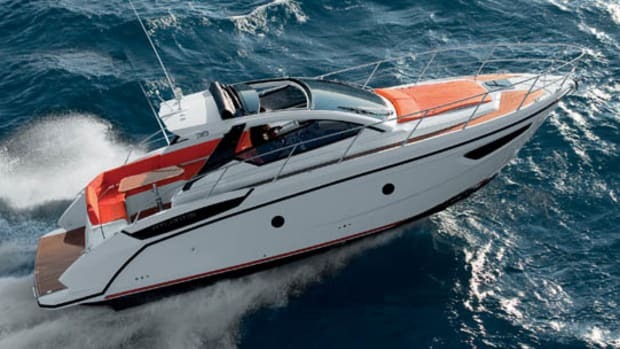 They also like Lonrach’s solid feel, which is due partly to a hull built with Vinylester resin and E glass that ranges in thickness from 3/8 to 11/2 inches and a hand-laid balsa-cored superstructure constructed with polyester resin and E-glass. 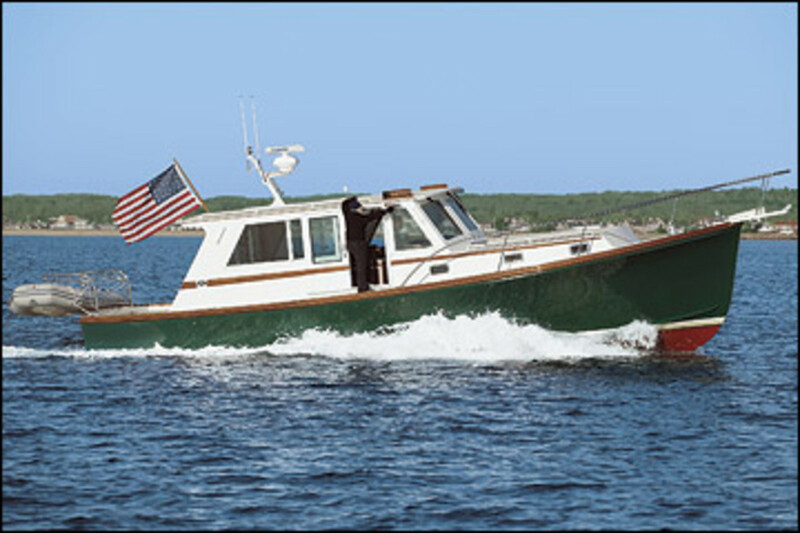 As for performance, The Lynches say they’re quite pleased with their new boat’s seakeeping, although I wasn’t able to evaluate it, as Nantucket Sound was flat-clam, and there weren’t even any other boats around (can’t imagine why) to generate wake. I can say that she was responsive, handled 360- and 180-degree turns tightly, without much outward lean and with little drop in rpm. I was also impressed that at her top speed of 31.1 mph, she burned just 38 gph, which works out to .82 mpg. Despite the frigid conditions, I enjoyed my time with Lonrach. But alas, all good things must come to an end. Back at the dock, I asked Jerry whether it—the two-year wait for a boat, the monthly trips to the yard, the loan—was worth it. 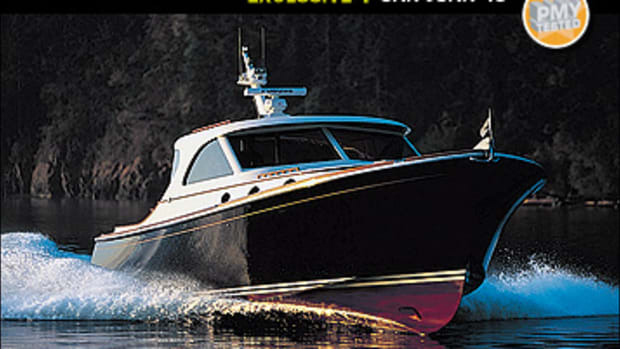 He smiled and replied without hesitation, “This is the ultimate boat. It’s about as good as it can get,” as he gazed at Lonrach with the admiration a parent might display at a child’s graduation.